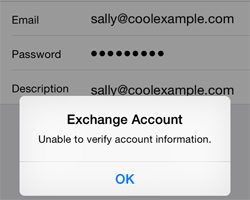 Exchange Account: Unable to verify account information. Here’s how to fix this error and add the email account to your iPhone by manually adding the server information. If you are having issues sending and receiving email on an existing iPhone email account, contact customer support. On the error, tap OK.
You will see your email account on the Accounts & Passwords screen.